Iran’s Revolutionary Guard has resumed its demolition of a historic Baha’i cemetery in Shiraz, Iran, after pausing for several months in the face of international pressure and the expression of outrage on the part of Iranians from all walks of life. Reports from Iran indicate that the Guard has now removed human remains from some 30 to 50 of the 950 graves of Baha’is in the cemetery, placing them in an open canal to make way for the construction of a new cultural and sports complex. In June, the Guards held a public celebration of their progress in clearing the site. In advance of that celebration, to which the media was invited, they used a heavy roller to compact the ground. A carpet was then laid over a number of graves and the commander of the Guards gave a speech attacking Baha’is. “The manner in which the Revolutionary Guards have gone about destroying these sacred grounds and, now, celebrating its demolition goes beyond the pale in terms of humane behavior,” said Diane Ala’i, the representative of the Baha’i International Community to the United Nations in Geneva. “Clearly, this latest action – a public celebration held upon the graves of innocent people – is an attempt by the Guards to justify to an increasingly outraged Iranian public the desecration of the cemetery and the treatment of Baha’is generally,” she said. “We call on the government of Iran to immediately put a stop to this desecration, and we ask the international community to likewise voice their concerns about this outrageous development,” said Ms. Ala’i. According to Ms. Ala’i, members of the Shiraz Baha’i community have pleaded with local authorities to enforce a permanent halt in the construction, offering also a compromise in which the sports complex could be built on the site away from areas where Baha’is are buried, while the graveyard itself is turned into a green space. The Baha’is have been told, however, that local authorities have no control over the Revolutionary Guards, who acquired the land about three years ago. More recently, however, concrete foundations have been poured into that excavation, and a number of signs have been posted proclaiming the Guards’ plan to build a sports and cultural complex that will include a library, mosque, restaurant, theatre, child care facility and sports hall. 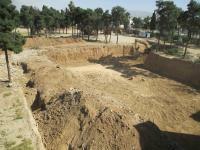 At the same time, Baha’is in the province have given voice to their deep anguish over the site’s destruction. In an open letter written to local authorities in May, for example, a 50-year-old Baha’i woman spoke of facing decades of oppression, capped now by this latest attack on a place where the bodies of her father, mother and sister – who were all killed by the government in the 1980s – had been laid to rest. “Yesterday… the cemetery where the bodies of my beloved family were buried was dug up and the soil was loaded onto trucks and taken away, so that no trace of evidence would be left of the crimes and atrocities committed by you over the past thirty years,” she wrote. Please go to The Baha’i International Community Website for others messages from the Baha’i International Community.